Conceptional orality in written texts WhatsApp messages in the classroom? GFL lessons are designed to enable learners to communicate in German in different situations. What does this mean in the era of YouTube and WhatsApp? Should the linguistic phenomena of these media be explored in GFL lessons, or have they perhaps already been included in textbooks or even exams? People communicate in very different ways with one another, depending on the particular situation and on whom they are addressing: if I wish to find out how a person is, I will use an entirely different form when asking my boss at the start of a meeting than I would if texting a friend on my smartphone. These different registers can be distinguished by categorizing them (see Koch & Oesterreicher 1985) according to the features of conception and medium. For both of these features, Koch and Oesterreicher distinguish between oral and written forms. While a message can be conveyed using either an oral medium (phonically, as in a conversation) or a written medium (graphically, as in a written message), the distinction is gradual as regards conception: any utterance can be attributed more to one or the other direction on a continuum ranging between conceptional orality and conceptional literacy. In this context, conceptional literacy describes linguistic usage that is based on standard language, characterized by grammatically complete and in some cases complex clauses. Because the recipient is not present and tends to be unknown during the situation in which the message is expressed, this is also described as the language of distance. By contrast, conceptional orality is a language of immediacy; it arises spontaneously and does not involve temporal planning. The communication partners are in the same situation in the same place, and share certain knowledge. In informal, spontaneous and private contexts in particular, people often use digital media to communicate in written texts that in terms of conception are realized in more of an oral manner. It can be observed that the degree of conceptional orality increases with the spontaneity of the message and/or the level of familiarity between the communication partners. The subject of a conversation can also prompt partners to use dialect, youth language or colloquial expressions that likewise belong to conventional orality. Written texts containing numerous elements of conceptional orality include for example comments posted beneath YouTube videos or indeed private WhatsApp messages. Another particular feature of texts of conceptional orality in digital media is that the partners use conventionalized symbols to express paraverbal elements of the conversation, such as emphasis and emotion: for example, words are entirely capitalized in order to emphasize them – this is also known as “shouting”. Emotions can be expressed with emoticons or emojis, or by using keyboard characters to represent facial expressions. Digital texts such as e-mails and SMS have meanwhile found their way into GFL lessons, too: even in standardized examinations such as those required for the Goethe Certificate, learners are confronted with digital texts such as guestbook entries on websites or e-mails. Example of digital texts in examinations | From: Goethe Certificate C1 model sentence, subsection Writing These digital texts are designed in conceptional written form. In the case of the e-mail example, merely the first two sentences can be regarded as being in conceptional oral form on account of the abbreviated and immediate form of their expression. The rest of the sentences are more written in conception. This is also logical for e-mails, particularly those in a professional context, that appear in textbooks and examinations. Private text messages and spontaneous e-mails tend to be characterized by greater conceptional orality. The question that arises here is how such texts should be dealt with in GFL lessons. How relevant it will be to deal with conceptionally oral texts (in a written medium) in the classroom will depend on the group of learners. Learners whose goal is to understand academic texts in German as a foreign language will hardly come into contact with conceptionally oral texts. And yet such texts are highly relevant to learners who will be spending time in the target language area. However, working with written texts that are conceptionally oral is also worthwhile for foreign language classes abroad: for one thing, learners will quickly find themselves confronted with such texts when browsing the Internet, no matter how far away they may be, and for another thing this is a good way to learn about linguistic peculiarities and different register uses. By analysing conceptionally oral texts, learners themselves can discover grammatical structures that deviate from written language conventions. Thus it is not so much about enabling learners to actively express themselves in a conceptionally oral manner, but about sensitizing them to different registers, while at the same time allowing them to take part – at least receptively – in authentic communication in a conceptionally oral context such as the Internet. When selecting written texts that are conceptionally oral, textbook authors need to decide the extent to which the texts should be conceptionally oral. Furthermore, when embedding the texts within the textbook, it is important to decide on the goal of the exercise: is the learner supposed to explore the content-related and pragmatic aspects of the text (“What is expressed in such texts?” and “With whom can one engage in this manner?”), or is the focus merely on linguistic peculiarities of the conceptional oral language usage? 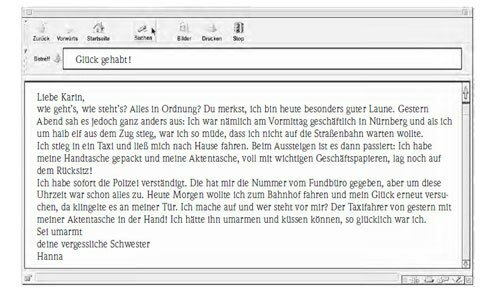 The latter option was chosen in the textbook DaF kompakt neu B1, which features a dialogue of text messages that are more conceptional oral in nature. In this dialogue, an interjection (Tja), ellipses (Weiß nicht, werde nachdenken! ), the expression of emotions by smileys and “shouting”, and the use of the words irgendeine, irgendwas, irgendwann, irgendwo feature as conceptional oral speech elements. This latter option was intentionally chosen so as to follow this phenomenon up with a brief “excursion into grammar” (which is actually morphology). Example of how to raise the topic of conceptional orality | From: “DaF kompakt neu B1”, p. 36 To highlight the difference between conceptional written and conceptional oral texts, it can certainly make sense to analyse an example as illustrated. Nonetheless, teachers should also give consideration to the aforementioned content-related and pragmatic aspects of conceptional oral texts in their lessons so that learners gain a clear sense of when such language usage is appropriate. Biebighäuser, Katrin/Marques-Schäfer, Gabriela (2017): Aspekte der Mündlichkeit in der WhatsApp-Interaktion zwischen brasilianischen Deutschlernenden und angehenden DaF-Lehrenden. In: Deutsch als Fremdsprache, Volume 54, Issue 2. Berlin: Erich Schmidt Verlag, p. 76-86. Koch, Peter/Oestereicher, Wulf (1985): Sprache der Nähe – Sprache der Distanz. Mündlichkeit und Schriftlichkeit im Spannungsfeld von Sprachtheorie und Sprachgeschichte. In: Romanistisches Jahrbuch, Volume 36, Berlin/New York: Walter de Gruyter, p. 15-43. Rösler, Dietmar (2016): Nähe und Distanz zur Mündlichkeit in der fremdsprachendidaktischen Diskussion. Versuch einer Annäherung. In: Deutsch als Fremdsprache, Volume 53, Issue 3. Berlin: Erich Schmidt Verlag, p. 135-149. Katrin Biebighäuser is a junior professor of German as a foreign language at Heidelberg University of Education. Her areas of research focus include foreign language learning with digital media.